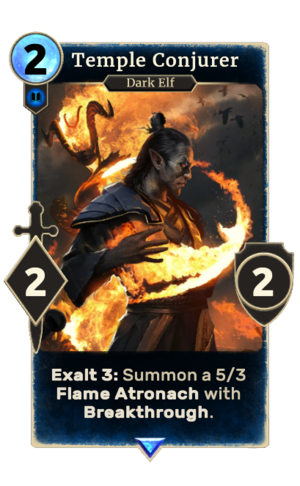 Exalt 3: Summon a 5/3 Flame Atronach with Breakthrough. Temple Conjurer is a rare Intelligence creature card. It is part of the Houses of Morrowind expansion. "All power flows from the gods." "I summon you in the light of the Three!" "Pffft! You are not worthy." This page was last modified on 1 March 2019, at 23:55.